A campfire is one of the basic ingredients of a successful, memorable, camping trip and gathering and processing firewood is one of the essential activities at any campsite where firewood is not provided. 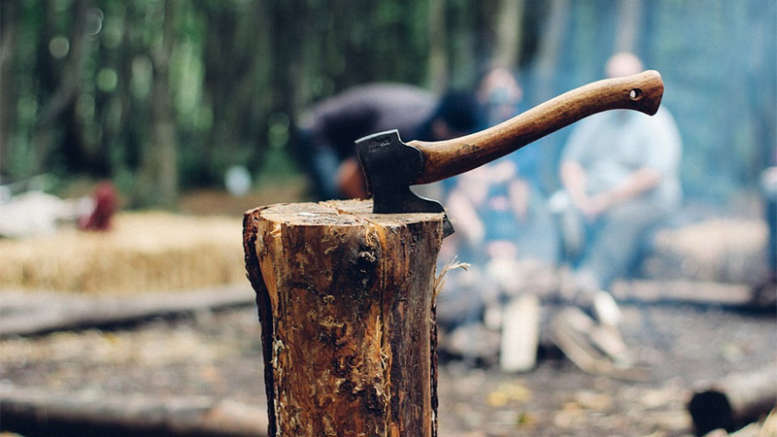 High-quality camping hatchets allow campers to gather and cut firewood more efficiently and turns what some might think of as a chore into a pleasurable and rewarding part of the total outdoor experience. Some hatchets may be used for hammering or driving stakes depending on the design. Determining what the best camping is depends on your personal needs and preferences. Below are five camping hatchets that will make campfire tending responsibilities easier and even fun. Qualities to look for in a good hatchet include how well the blade maintains a sharp edge, how the head is attached to the handle, and an ergonomic handle that doesn’t transfer the impact of chopping to your hands and arms. 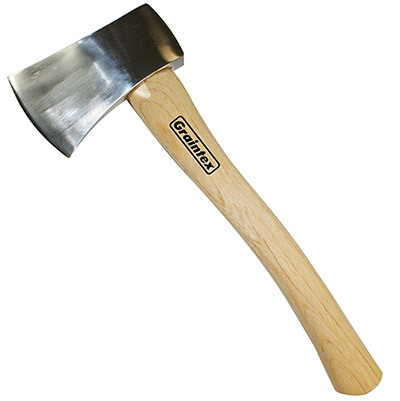 A hatchet handle is 10 to 16 inches long. An ax handle may be anywhere from 19 to 31 inches long depending on the use. Hatchets usually weight between 1 and 1.5 pounds. The average ax weighs around 4 pounds. An ax requires 2 hands. Chopping with a hatchet requires just one hand. This is a good camp chore hatchet at a reasonable price. It’s strong and light and the balance is good. The head is attached to the handle with epoxy. Some users have complained that the head comes loose after only a small amount of use. One user resorted to wrapping the head with duct tape to be sure it didn’t come off but this is not a common experience. The chopping edge is not razor sharp originally but it can be brought to a fine edge with a modicum of work with a sharpening stone. After it’s sharp, it hold the edge well. The Fiskars X7 Hatchet is well balanced and an ideal tool for chopping kindling and small-to-medium sized logs while camping and hiking. Primarily known as a maker of scissors, Fiskars is known for delivering its products with an ultra fine edge. The flat portion of the blade can be used as hammer. The plastic handle can take extended exposure to the elements without warping. It’s easy to choke up on the handle for precision cutting. Many users find the Fiskars X7 to be the ideal hatchet for home fireplace kindling cutting. As hatchets go, the Husqvarna is a heavy one, 2.2 pounds. It has a curved hickory handle that give it an ergonomic fit in your hand. The handle is attached to the head with both wooden and steel wedges. It comes with a light coat of oil rather than varnish. It is recommended that you periodically treat the handle with a light coat of boiled linseed oil. The grain in the handle is 75-90% vertical, which is desirable – the more vertical the grain in a wood handle, the better. The hatchet comes reasonably sharp and takes a keen edge if you put a stone to it. Some otherwise happy users replace the small brown leather sheath with something more substantial. Each Gransfors Bruks Wildlife Hatchet is forged by hand using techniques perfected in the mid-1800s. Each smith is expected to stand by his work and as a symbol of that he stamps his initials on each hatchet he makes beside the Gransfors crown logo. The personal attention to each hatchet is reflected in the price. 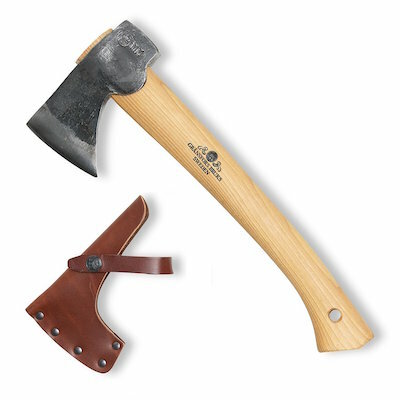 The Gransfors Bruks Hatchet retails for over $130 while the Husqvarna Hatchet (also on this list) is less than $50 and the Bear Grylls Survival Hatchet (also on this list) around $30. Users think about the Gransfors Bruks as a piece of outdoor equipment art and buy it with the idea of handing it down to future generations. The head is high carbon steel with a 3” wide cutting surface. It comes from the factory with a razor sharp edge. The back side of the head can be used for a hammer. The handle is made from American hickory and finished with linseed oil and a coating of beeswax. The handle protrudes slightly from the eye, a measure that increases handle security. The small sheath allows you to belt-carry the hatchet. The Gerber Bear Grylls Survival Hatchet is compact and lightweight. The unique feature of this hatchet is that it’s “full tang,” meaning that the blade, head and handle are all one piece. No chance of the blade coming off this hatchet. The hatchet arrives fully sharpened right out of the box. “Finger cutouts” near the base of the blade allow the user to completely choke up on the hatchet and use it almost like you would use a knife. In fact, some users do use it as a knife and report that it does a good job of slicing meat, vegetables and fruit. Hammering and driving can be accomplished by turning the hatchet sideways.The belt sheath is made of heavy reinforced nylon and closes with a velcro flap. It has 2 belt loops that secure the hatchet firmly to your side. The handle grip is made of Polypropylene rubber that provides a firm, non-slip grip. When using a hatchet, kneel on the ground. If you are standing and miss your chopping mark there’s a chance that the hatchet could hit your leg or foot. Be the first to comment on "Best Camping Hatchets – Here’s 5 Different Hatchets To Consider"